Attempts at isolating Russia will not work, Foreign Minister Sergey Lavrov said at a press conference on the outcome of 2014. The minister said Moscow is calling on Washington to resume cooperation that was thwarted last year. “Relations between Moscow and Washington significantly deteriorated in 2014. We call for resuming effective cooperation at a bilateral and international level. But dialogue is only possible if based on equality and respect for each other’s interests,” he said. 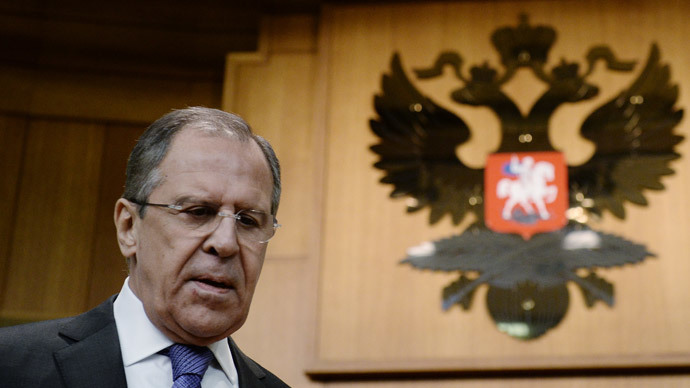 Cutting ties with NATO was not Russia’s choice, according to Lavrov. “NATO followed the US in its drive for confrontation. NATO made an absolutely politicized decision to halt civil and military cooperation. Almost all projects have been frozen,” Lavrov said. Moscow “will not allow a new Cold War,” he added. Commenting on US President Barack Obama’s State of the Union Speech, Lavrov said it showed Washington wanted to dominate the world and required all the rest to acknowledge their superiority. Lavrov has denied allegations of a Russian military presence in southeastern Ukraine, calling on those who believe the opposite to prove their point. “I say it every time: if you are so sure in stating that, confirm it with facts. But no one can or wants to provide them,” he said. Lavrov said he would try to negotiate an immediate ceasefire in eastern Ukraine at talks in Berlin due to take place later in the day. The foreign ministers of Ukraine, Germany and France are expected to be present. Ukrainian President Petro Poroshenko is, according to Lavrov, ready to discuss the peace plan offered by President Putin on January 15, despite earlier reports of its rejection. “We will do everything possible to turn the situation around to follow the Minsk agreement. This is very simple. The Minsk agreement is a peaceful option,” the Ukrainian president said, as reported by RIA Novosti. Recent days have seen an escalation of violence in eastern Ukraine. Government troops launched a massive assault on militia-held areas, in accordance with a presidential order. Residential areas have come under fire with reports of several civilian casualties. A hospital in Donetsk was severely damaged on Monday, when at least two shells struck it. Human rights groups have called on both sides to protect civilians in conflict zones. Amnesty International called on militias not launch operations from populated areas, and demanded that Kiev stops its indiscriminate shelling of residential blocks.